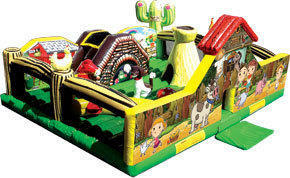 The My Little Farm educational inflatable playground is designed to educate and entertain toddlers in an adorable farm setting. This game offers a small climb and slide and several 3D animals and structures, such as a dog, horse, chickens, hay stock and a cactus. Kids can practice their colors, try to find my color counting game, matching objects to their correct number. Find My Other Half enhances matching skills by matching pieces in yummy fruit shapes, and Who Am I gives a toddler lesson in zoology by matching animal shapes with their names.